9/6/1975 SOVRANO MILITARE ORDINE DI MALTA - Segnatasse (Cat. Unificato/Yvert. 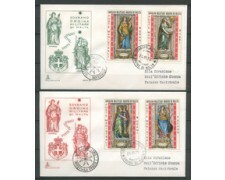 11/16) serie completa su 3 buste FDC Filagrano con annullo del Primo Giorno di Emissione. 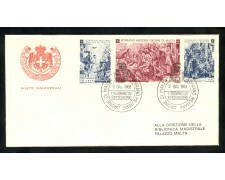 06/9/1975 SOVEREIGN MILITARY ORDER OF MALTA - Postage (Cat. Unified / Yvert. 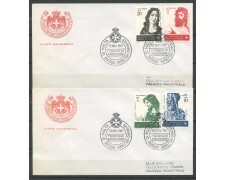 11/16) Complete Series on 3 Filagrano envelopes FDC with cancellation of the First Day of Issue. 10/4/1975 SOVRANO MILITARE ORDINE DI MALTA - Segnatasse (Cat. Unificato/Yvert. 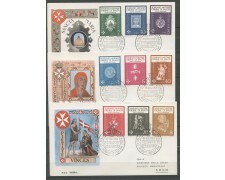 1/10) serie completa su 3 buste FDC Filagrano con annullo del Primo Giorno di Emissione. 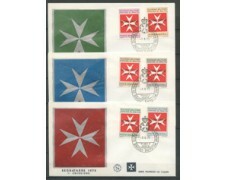 04/10/1975 SOVEREIGN MILITARY ORDER OF MALTA - Postage (Cat. Unified / Yvert. 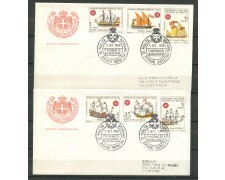 1/10) Complete Series on 3 Filagrano envelopes FDC with cancellation of the First Day of Issue. 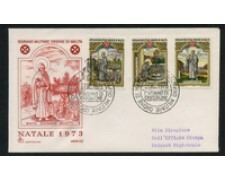 3/12/1973 SOVRANO MILITARE ORDINE DI MALTA - Natale (Cat. Unificato/Yvert. 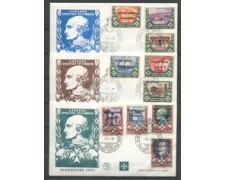 91/93) serie completa su busta FDC Capitolium con annullo del Primo Giorno di Emissione. 03/12/1973 SOVEREIGN MILITARY ORDER OF MALTA - Christmas (Cat. Unified / Yvert. 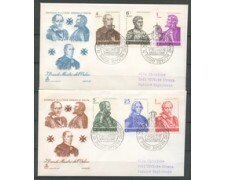 91/93) complete series on Capitolium envelope FDC with cancellation of the First Day of Issue. 10/5/1974 SOVRANO MILITARE ORDINE DI MALTA - Grandi Maestri (Cat. Unificato/Yvert.94/99 ) serie completa su 2 buste FDC Capitolium con annullo del Primo Giorno di Emissione. 05/10/1974 SOVEREIGN MILITARY ORDER OF MALTA - Grand Masters (Cat. 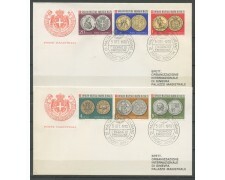 Unified / Yvert.94 / 99) Complete Series on 2 envelopes FDC Capitolium with cancellation of the First Day of Issue. 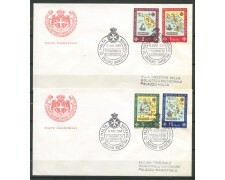 21/10/1974 SOVRANO MILITARE ORDINE DI MALTA - Virtu' Cardinali (Cat. Unificato/Yvert.100/103 ) serie completa su 2 buste FDC Capitolium con annullo del Primo Giorno di Emissione. 10/21/1974 SOVEREIGN MILITARY ORDER OF MALTA - Virtu 'Cardinals (Cat. 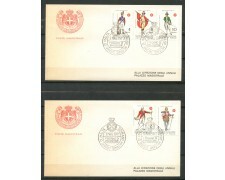 Unified / Yvert.100 / 103) complete series on 2 envelopes FDC Capitolium with cancellation of the First Day of Issue. 10/4/1975 SOVRANO MILITARE ORDINE DI MALTA - 125 g. Francobollo Espresso " Delfini" (Cat. Unificato. E/1 - Yvert. 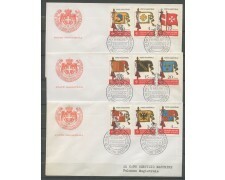 107) busta FDC Filagrano con annullo del Primo Giorno di Emissione. 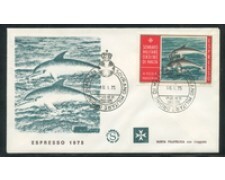 4/10/1975 SOVEREIGN MILITARY ORDER OF MALTA - 125 g. Espresso stamp "Dolphins" (Cat. Unified. E / 1 - Yvert. 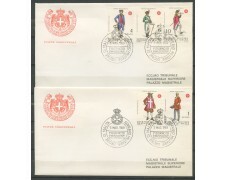 107) Filagrano FDC envelope canceled the First Day of Issue. 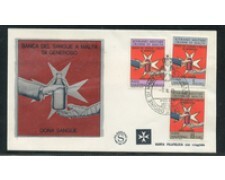 9/6/1975 SOVRANO MILITARE ORDINE DI MALTA - Banca del sangue (Cat. Unificato. 107/109 - Yvert. 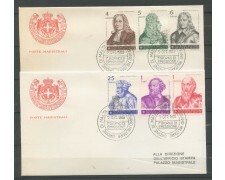 110/112) serie completa su busta FDc Filagrano con annullo del Primo Giorno di Emissione. 06/09/1975 SOVEREIGN MILITARY ORDER OF MALTA - Blood Bank (Cat. Unified. 107/109 - Yvert. 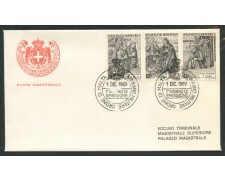 110/112) complete series on Filagrano envelope FDC with cancellation of the First Day of Issue.